Rapator which means "plunderer" was a Theropod dinosaur and inhabited Australia. Very little is known about this dinosaur because the only fossil has been found so far and it was a finger bone. From that one bone they have concluded that this dinosaur would have been roughly 9 meters tall and lived during the early cretaceous period. 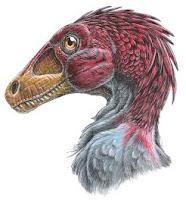 Some people believed that it was not a Theropod, but a alvarezsaurdae family genus. If it is then it would be by far the largest alvarezsaurdae ever discovered. It was originally described by Friedrich Von Huene in 1932 but was changed to Rapator because that sounded much cooler. All mentioned of the Rapator can't really be realistically correct because obviously there's going to be a lot of guess on the topic.